Step 1. Invert the divisor. Step 2. 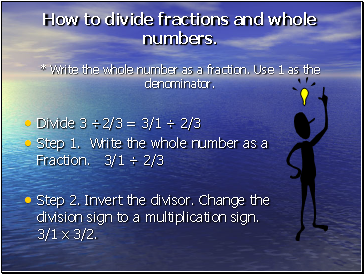 Change the division sign to a multiplication sign. 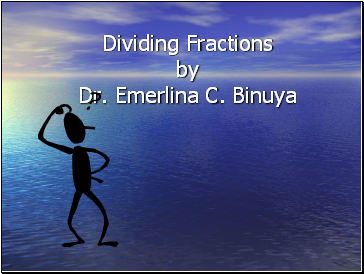 How to divide fractions and whole numbers. * Write the whole number as a fraction. Use 1 as the denominator. Step 2. Invert the divisor. 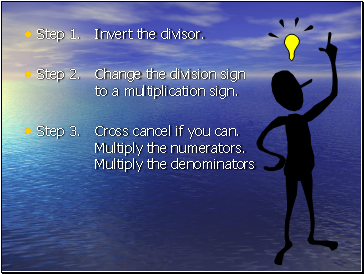 Change the division sign to a multiplication sign. 3/1 x 3/2. Step 4. 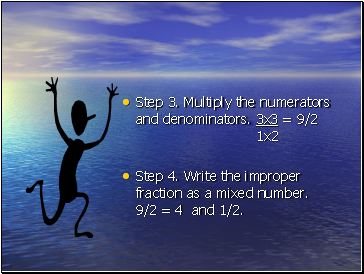 Write the improper fraction as a mixed number. 9/2 = 4 and 1/2. 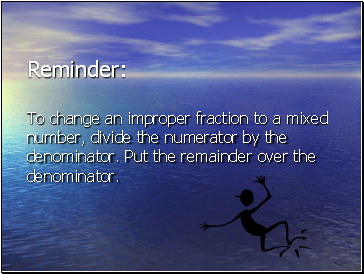 Reminder: To change an improper fraction to a mixed number, divide the numerator by the denominator. Put the remainder over the denominator.